Valentino's Eatery will "Light It Up Blue" for our 5th Annual Fundraiser Event on SUNDAY, APRIL 7, 2019 to celebrate Autism Awareness month. We hope you will come support Valentino’s Eatery as we celebrate and promote this day by showing off our BLUE to support Autism Awareness not only for our son, Christian, who is on the spectrum, but also for the many other children, adults & families in this world who are affected by ASD (Autism Spectrum Disorder). We invite you to join us on this day, during our dinner hours…Dine-in or Carry-Out.…, to help support Autism Awareness. DINNER SERVICE WILL BEGIN AT 2PM – 8PM on April 7th. 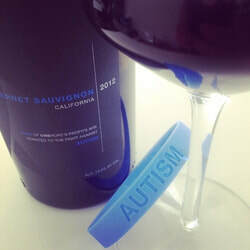 We will be offering a variety of food & drink specials this day, including our featured wine….ONEHOPE Cabernet Sauvignon (California), as HALF of the profits from ONEHOPE Cabernet sales are donated to non-profits that provide behavior therapy to children with Autism. At the end of the day on April 7th, Valentino’s Eatery will donate a portion of their profits, along with customer donations & monies raised from the raffles that day to two local organizations here in AZ who provide services to children & adults with autism along with support for their families on a day to day basis. This year we will again be donating to Hope Academy for Autism https://www.facebook.com/hopeacademy4autism and to Pawsitive Friendships www.pawsitivefriendships.org. Our goal this year is to surpass $2,000 in donations to give to these two local organizations. Last year we raised $1,800, of which was given to both local organizations. Both organizations will be at the event and we also will have live music featuring Kenny Samuelson playing some relaxing dinner music throughout the day. Call us today to make your dinner reservations for our “Light It Up Blue” fundraiser event on April 7th in our dining room or out on our patio for dinner or pick up a Carry-Out order. Or contact us if you kindly can donate an item for raffle or monetary donation for the event day. ​We hope you can help show your support on Saturday, April 7th as we welcome you to come “LIGHT IT UP BLUE” with all of us at Valentino’s. We are looking for support for additional donations from our customers & local businesses, whether it be a monetary donation or items donated for our event raffles. These items will help raise monies to donate along with our contribution to these two great local organizations who are there to help children & adults on the spectrum. We hope to exceed our goal of $2,000; so, we hope you will come and help support! !